I'm a 1PDC 2013 Winner! My last minute One Page Dungeon Contest entry won a prize! I took the "Best Non-Traditional Map" category. And here I was thinking that no way in hell would anyone take this little gonzo scenario seriously. Be sure to check out the list of other winners at the One Page Dungeon Contest page! The Gold Standard from the Dragonsfoot forums. Labyrinths of Madness by Gavin Norman of City of Iron. Dungeons & Dragons Variant Edition, by Don Jolly. Be sure to check out his little games Gax & Vox, too! And his book, The Flapjack Canyon, free in PDF from Lulu.com. Options for Swords &Wizardry Complete: Psionics, by Cameron DuBeers. 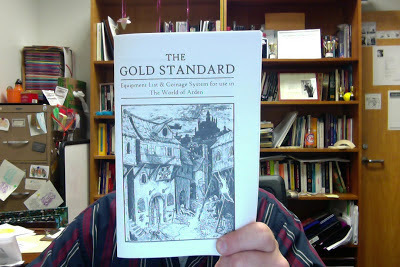 Also, be sure to check out his module There's Something Rotten in Riverton, which I can't get to print in booklet form. The Cave of Nanoc, by Dylan Hartwell. Blood Ceremony of the Voivode, by Ben Djarum. 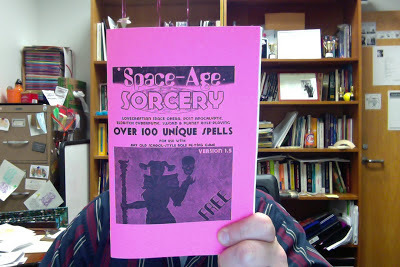 Space-Age Sorcery has been updated! Go grab version 1.5! 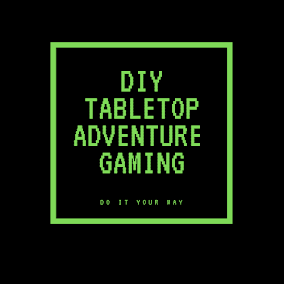 Tarnhelm's Terrible Tome: House Rules for 0e Games from RetroRoleplaying.com. Lord Gwydion's Beast of the Week Collection, by Dennis Laffey. 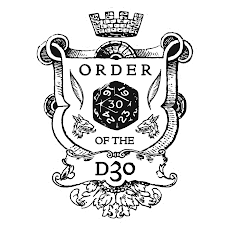 An oldie but a goodie: The Concordance of the Order of the d30. Finally printed this sucker out. 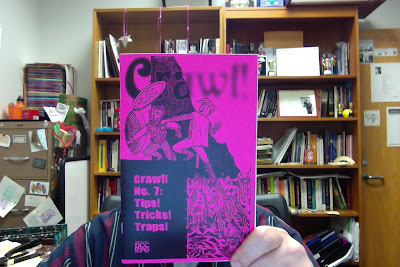 CRAWLzine #7! Awesome stuff from Rev. Dak. Also, be sure to check out the web extra! Christian Walker is back in action with two new one-sheet zines! First up is Shudde M'ell Confidential, for Call of Cthulhu. He's got two issue out so far, and a Pinterest board with extra content (beats the hell out of the usual use of Pinterest, which is fashion and food and mommy advice. Also, best line in #2: "Starlets do not fight. They have people for that." Precious, baby, precious! This next one from Christian is I Want to Live in Los Angeles, which explores a modern setting for Basic Fantasy Role Playing. Hot Damn, Just Go Read This. This post has nothing to do with RPGs. Just go read this. If you can get through it without getting a lump in your throat, you aren't alive. This is one of the best profiles I've read in a long time. Seriously, click on that link and read the whole damn thing. The Cave of Nanoc is a Labyrinth Lord-compatible one-shot adventure ripe with Conan references throughout, both to Ahh-nold's film version and the stories of REH. The main action has the hero donning a pair of boots that lets a PC walk upside down on the ceiling and then sends the party into a cave to battle dangerous Nanoc bats, poisonous scorpion-like Climbers, and a seductive sorceress who hides a bowel-cleansing secret (no, not the secret to bowel-cleansing, but . . . oh, nevermind). While the scenario comes off a bit jokey on first read, this truly has the potential for an early TPK if the players don't make wise decisions early on. Bathhouse of Blood by Tedankhamen, aka Ted Bonnah. I haven't even logged into Blogger or checked this blog since the first week of May, as I was knee-deep into final exam preps and now I am neck-deep in exam week and exam grading. Needless to say, I'm a bit overwhelmed at the moment. 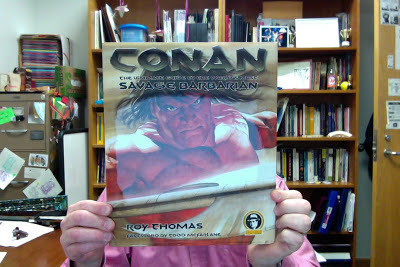 AND now I find out that Blogger decided to eat a post I had scheduled to appear on May 3rd that announced the winner of the Conan Contest. Harrumph! Check back soon for the announcement. 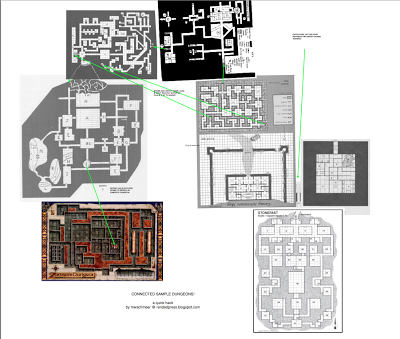 It's a map connecting all of the sample dungeons from TSR-era D&D, from the original edition to The Classic Game of Dungeons & Dragons. You can grab a PDF here. We now have 39 entries of Petty Foods. I'd love to get this up in the 50 to 60 range so we could have a 2d24 or a d66 (2 d6, one of them rolled for the tens place) chart. See here for submission requirements. I'm also working on finishing up a few more Petty Gods assignments.